On Sunday night, the Miami Heat went up 21-18 in the first quarter on a Mario Chalmer’s turnaround jump shot and never looked back. Leading by as much as 32 points in the third quarter, the key theme in Sunday’s win was “identity.” In the words of Erik Spoelstra, “It was a solid, disciplined team win…There was a real focus and commitment to play to our identity.” Finally, the championship calibur team that Erik Spoelstra and Pat Riley envisioned is turning into a reality. The Miami Heat are figuring out who they are and becoming better and better as a team and not just as individuals. Perhaps the main culprit of this team-oriented offense is LeBron James who commented on Sunday’s win saying, “We couldn’t have scripted a better start.” He also added that the Heat simply “played Miami Heat basketball.” King James once again led the team with a team-high 6 assists and acted as a facilitator for much of the Heat’s offense. The versatility of LeBron on both ends of the floor is really starting to become evident as Erik Spoelstra has utilized LBJ at the point guard position, shooting guard position, small forward position, and now at the power forward position in many of Miami’s offensive sets. LeBron finished the game with a game high 23 points to go along with 13 rebounds to lead Miami. 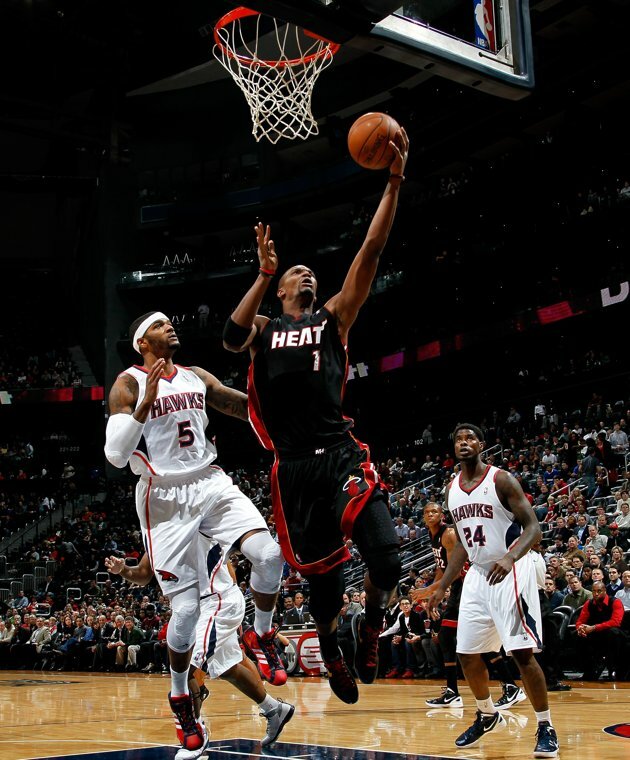 Kevin C. Cox/Getty Images, Chris Bosh grabbed a season-high 16 rebounds in Sunday's victory over the Hawks. As mentioned before, the Miami Heat are finally coming together as one and everybody is filling into their niches quite nicely. Chris Bosh was astounding on the defensive end and finished with a career-high 16 rebounds to go along with 14 points. And Dwyane Wade? D. Wade was his usual spectacular self and and luckily was only needed for 24 minutes to give him plenty of rest before the Heat finish a strech of 3 games in a row on the road. Wade finished with 21 points, 5 rebounds, and 3 assists while shooting 50% from the field. Moreover, 11 different players scored for Miami while 5 different players finished in double figures. Hopefully, the Heat can carry over this theme of “identity” on their road trip and not revert back to the same ole’ stagnant offense, lack of ball movement, and Spoelstra’s pet peeve, “hero ball.” Look for Miami to come out strong against the Bucks tomorrow, who have already beaten the Miami Heat twice this season.